Study: Consider a time in life when you used power and authority well. What helped and guided you? Pray: Ask the Lord for the wisdom and courage to live your life in accordance with God’s commands. Serve: How can you make a difference with your life today? What is in your reach to do that makes an immediate difference? In great and small ways, we all exercise power and authority. Some people make daily decisions that shape the lives of nations; others rule kingdoms no bigger than the back garden. Yet regardless of size and shape, the fact remains that power and authority are part of human life. Having these two dynamic attributes, however, are no guarantee that they will be used wisely and well. History is filled with both good and bad examples where power and authority have been used – for great good and great harm. Like all gifts, power and authority find their origin in the Lord. God is the source of all life, and every blessing, every ability, derives its strength from the throne of Heaven. Both the first reading and the Gospel today acknowledge this truth: Moses proclaims that God will raise up a future prophet for the people; Jesus teaches with authority and casts out demons. As Christ fulfills the promise of Moses, the Lord extends his power to conquer sin and death that we might have hope in this world as we look to the world to come. Do I acknowledge God’s power and authority in my life? Do I use the power and authority I have for God’s glory? Think about it. We often know what we should do…the question is, do we do it?! The Lord’s commands (forgiveness, prayer, service to the poor, justice, etc.) are not nice things to think about in our spare time. They are dictates from on high that are meant to enliven us and fill us with grace, peace, and joy. The problem of course is that our own ego can get in the way and redirect our energy away from God. In these moments, we search our conscience (Remember the Examination of Conscience last week?) and return to the Lord. Since all power comes from God and flows through us, it might be helpful to recall that one day we are going to stand before Jesus Christ. With loving eyes he will look into our souls and ask what we did with the gift of life we were given. It’s not the mistakes we made that will be hardest to bear, but the opportunities we missed to good with what we had. Perhaps today we might reflect on the Lord’s commands for our lives, and reconsider how we might put them into practice with the power we possess. How does someone pray? What are the practical tips that can help us grow closer to the Lord and one another? How do you determine a time, place, preparation, and format? This presentation was given at “Theology on Tap” at Dubh Lihn’s in Duluth, MN on November 11, 2013. If you have 30 minutes and want some helpful pointers for better prayer, then this podcast is for you! Study: Recall a time when you made a serious mistake. What steps did you take to make it right? Do you have any unfinished work that needs to be done? Pray: Saying “I’m sorry” and “I forgive you” can be very difficult; don’t try it alone! Ask the Lord for the grace and strength. 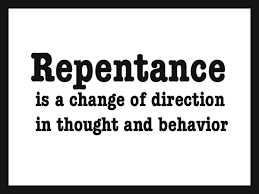 Serve: How can you help another on the path to repentance? How might you encourage people to seek healing and forgiveness? To demonstrate the exercise our 4th grade teacher, Mrs. Tempesta, would put a problem on the chalk board and demonstrate line by line, showing the work and how the process repeats until you made your way through the entire problem. At the end you would have the answer, with all the work to prove it. We all make mistakes: we say things we can’t take back; do things we regret; allow things to happen that we’d give anything to erase. And while we can’t change the past our faith tells us that we have a process that can bring healing and restore relationships. Like long division, we find our mistakes, REPENT, and rework a solution that follows a new path of behavior. Perhaps it’s been awhile since we stepped into a confessional. Perhaps it’s been awhile since we have honestly looked into our hearts. Today we can take a moment to look inside, see what doesn’t belong, and make the move to repent of our sins and turn to the Lord. May we see in the example of Jonah and Jesus today that we have hope; God keeps calling – inviting us to turn away from sin and embrace the Good News. And if you are looking for some help in checking out your heart, try these options for an Examination of Conscience. Study: Reflect on an experience in life when you have been called to do something. Who called you? What did it feel like? 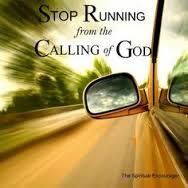 Pray: Ask the Lord for guidance to discern how to follow Jesus Christ today. Serve: Are there people in your life who are experiencing a calling? How can you help them discover their path? Have you ever had moments in life when you wish the answers were written in the sky with letters that were clear and easy to read? Where there is no doubt what to do; no hesitation that a certain choice is the best; no worry that something has been missed? The question surfaces frequently: How do we know the Lord’s call for our lives? A call to action. Both Samuel and disciples do something. 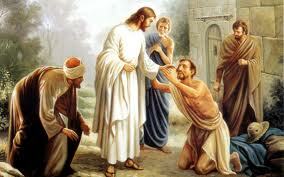 Samuel reaches out to Eli; the disciples stay with Jesus and one of them (Andrew) brings his brother Peter to meet the Lord. The same three steps continue today. God keeps inviting! The Lord’s grace ceaselessly pours out upon the earth, inviting and empowering us to draw closer to God and one another. Everything we have comes from the Lord, who takes the initiative to reach out to us in love. Our response – both in word and deed – completes this initiative. Accepting the Lord’s call we grow in wisdom and strength, developing our God-given gifts for service in the world. As we continue to say yes to the Lord’s guidance we become more and more alive, become a conduit through which Christ’s mission touches the hearts and lives of others. Start by reading the Scriptures! (It is the Word of God, after all.) I recommend first digging into the Gospels. Pray everyday. It doesn’t have to be very long, but it does have to be real and from your heart. Take a couple of minutes to count your blessings, make your petitions, and close with the Lord’s Prayer. Go to Confession. It’s a powerful way to begin again with God’s help. May we say yes to the Lord’s call in our lives, responding with full and open hearts, serving one another with the strength of Jesus Christ! Study: Recall a moment when you “died” to something sinful. Who or what gave you strength? Pray: Thank the Lord for the precious gift of your life – and count your blessings! Serve: How can you offer some of your time or talent to help another face life and death issues? Living on the shores of Lake Superior, I am blessed with an abundance of water in my life. Here in northern Wisconsin – with our countless clean, freshwater lakes – it is easy to take for granted this precious resource. Water is essential for human life. Approximately 55-60% of our bodies are composed of water, and this crucial substance is always present wherever people are living and thriving. What’s more, all life on our planet requires water – it simply is invaluable for existence. Yet a surplus of water can lead to destruction. A flood may literally wash away everything in its path with power that cannot be overcome. Too much water and life drowns, unable to find the proper balance to survive. 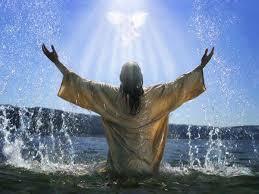 Through baptism, we are joined to the death and resurrection of Jesus. Freed from sin by the Lord’s sacrifice on the Cross, we are raised up to newness of life in this world as we prepare to be united to the Lord forever in heaven. The Baptism of the Lord by John the Baptist reminds us that our experience of God draws on our relationship with the Lord. His life becomes our life; his death frees us from our death. Configuring our lives to Jesus through our baptism, we not only become his disciples – we open our hearts to receive his grace. May we call upon that grace as we face the challenges and blessings of life today. Trusting in Christ, we engage our lives for service as we follow his example of life and death. The following three talks were given at a Catholic Men’s Retreat sponsored by the Knights of Columbus in Hayward, WI on September 13, 2014. In these talks you will find a practical exploration of some ways that we can grow closer to the Lord through Study, Prayer, and Service; it should be no surprise to my readers! These “Three Great Things” are the very foundation of this site, and it seemed only fitting to spell out a few opportunities that we have to deepen our relationship with Christ. All three talks are freestanding: you can listen to them alone or together as a set. It should become readily apparent, however, that these three are interrelated – prayer and service; service and study; study and prayer – they build, support, and give meaning and purpose to one another. Yet by engaging each one separately, it is my hope that we can tease out some everyday opportunities that foster our faith and offer ready made applications for life. When you click on the underlined/bold text, you will be redirected to a site where you can hear the talks. My prayer for 2015: that we all draw near to Jesus Christ (in any number of unique and practical ways) through our Study, Prayer, & Service!